I would first of all like to thank cooldudebro for deciding to debate this topic. This is indeed an important subject, military spending is whats used to protect a nation from harm. 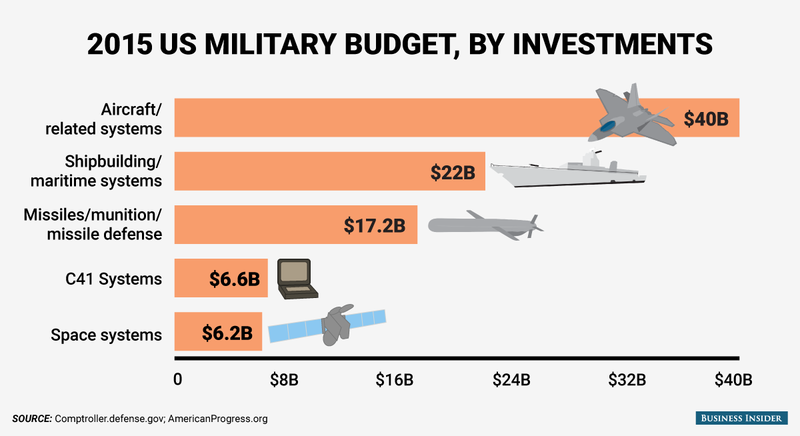 What I am trying to argue here is that the United States spends too much on its military. The total military budget for the united states as of 2015 was about $610 billion dollars, which I think is much too high and we should gradually spend less on military. Notice how I say gradually, since we can not suddenly or else it can have a bad effect on the economy because the private sector won't immediately replace this spending. 1. U.S. spends too much on military. 2. U.S. has bad spending habit and much debt. 3. We do not need wars to solve conflicts. The total military budget of the United States as of 2015 was about $610 billion. That is much more than its closest competitor, China, which had a $216 billion military budget. The United States had a higher military budget then the next seven highest spending countries COMBINED. To compare U.S. military spending to other nations spending, here is a comparison. This shows the United States spend A LOT on Military compared to other nations. Whether we should cut spending really depends on whether it is worth doing so or if we should remain this high in Military spending. Also, the military spending makes up the third highest in total federal spending as of 2015. This shows you the data. 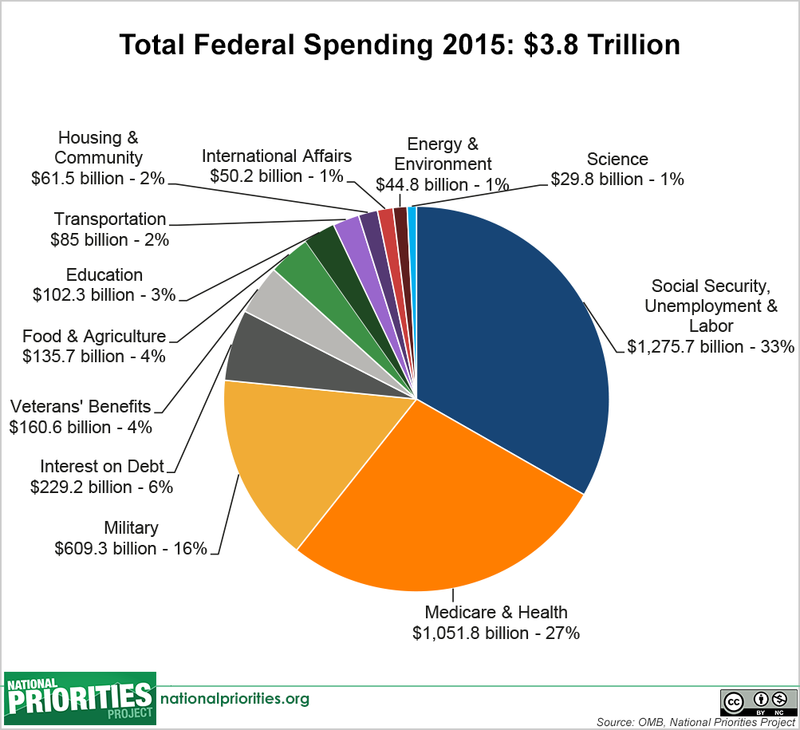 So military makes up 16% of total federal spending. That may not seem like a lot if you compare it to Social Security, unemployment and Labor costs but the United States has a bad spending habit already with a $18 trillion national debt as of 2015. This leads to my next argument. The United States had a $439 billion federal deficit as of 2015*1. This means the United States is LOSING money, which is never good. The United States is also the country with the highest debt, with a total national debt of $18 trillion. The total national debt has been rising. Here is a graph of the national debt and debt ceiling since 1980. Source: Calculated by GVCM using data http://www.whitehouse.gov and www.usdebtclock.org. As you can see, the United States debt ceiling has been going up and never came back down. It is clear by looking at this that the united states needs to do something about its debt problem. One of the best and obvious ways to do this is by reducing U.S. spending, and reducing military spending is one spending cut that is worth doing, because we do not need to spend so high amounts. This now leads to my last argument. Wars is the reason we have so high military spending. We would not need so high military spending if it wasn't for wars. Wars do not solve conflicts because wars ARE conflicts. Here is a graph that shows U.S. military spending. As you can see, U.S. military spending has been going up and down and starting going up to its highest since 1960 ever since 2001. Why is that? It is obviously because of the war in Afghanistan. Military spending has dropped a little in 2012. So, we do not need our high military spending if we do not have war. So, is war better or good for our world? The United States has been intervening into other nations to help other nations. As a result of U.S. foreign entanglements, the world is no better and is in fact some ways worse after U.S. intervention. As a result of U.S. invasion on Iraq, the terrorist group ISIS was decidedly formed by angry Iraqi's. So the invasion of Iraq may have been a bad idea. As Dexter Filkins said on newyorker.com, "Here is what happened: In 2003, the U.S. military, on orders of President Bush, invaded Iraq, and nineteen days later threw out Saddam’s government. A few days after that, President Bush or someone in his Administration decreed the dissolution of the Iraqi Army. This decision didn’t throw “thirty thousand individuals” out of a job, as Ziedrich said—the number was closer to ten times that. Overnight, at least two hundred and fifty thousand Iraqi men—armed, angry, and with military training—were suddenly humiliated and out of work. What I am saying here is that military intervention leads to more hate which leads to more terrorism(and you do not have to be a liberal to agree with that). I can go on and on about different examples but it is not hard to see why military intervention would lead to more war and hate. Another great point to make is that Iceland has no active military force and has been in only one war with a nation(recently). Iceland has only been in war during the Cod War with the U.K. which was not a direct conflict anyways. Now compare hatred and terrorism to Iceland to Hatred and terrorism to the United States. Iceland is ranked as the most peaceful country in the world*3. There is no huge terrorist hatred to Iceland but their is to the United States. This is because of the United States large military intervention which was not needed and could have been avoided. Now ask yourself this, would Iceland be hated and threatened by terrorists today if it used a huge military to fight Iraq? It may be best to end the wars we are in now. 1. The United States spends much more than it needs to on its military, spends more than the next seven countries with the highest military spending COMBINED. 2. The U.S. already has too much in debt and it has a federal deficit which leads to more debt, so we must decrease overall government spending. Decreasing Military spending is a great way to start since we spend too much compared to other countries anyways. 3. Wars are not needed to solve conflicts, it just creates more hate which can lead to more terrorism. Good diplomacy is better than overwhelming military force. We should stop and prevent wars wherever possible. One last point, by decreasing military spending I do not want to do huge sudden cuts. It would be better to slowly and gradually decrease overall spending on military. The money could be used for decreasing the budget deficit. I also do not want to eliminate the military, we could keep the military budget at the federal budget deficit which is still high but not overwhelmingly high. Overall, I think these are effective arguments for why the United States military budget should be decreased. I stand by the value of safety economically and from the art of war. Allow me to elaborate. (1) GLOBAL LEADERSHIP – The United States of America is now the only dominant power in the world. This provides America with immense opportunity but awesome responsibility. The United States must accept and maintain global leadership through a clear and consistent articulation of vital national interest and goals and the readiness to defend those interests and goals. America must continue to be a force for world peace, democracy, human rights and humanitarian assistance. (2) BIPARTISANSHIP- The United States cannot lead the world without the support of the American people. National security policy must be bipartisan. America’s leaders need to speak with one voice to the world. Foreign policy should be bipartisan. America’s leaders need to speak with one voice to the world. The Congress will debate the best course as it should, but there is no room for partisan politics and partisan gain in doing what is right for America in the international arena. "Peace through strength is not a lonely position. In fact, there are numerous voices in the United States and in Israel calling for more political and diplomatic pressure and engagement. And many are cautioning against an Iranian (or Syrian) policy that focuses exclusively on a preemptive strike — including a former U.S. Army Chief of Staff, a former head of the U.S.Air Force, and recent heads of the Mossad and Shin Bet. American foreign policy leaders should heed this advice — and learn the lessons of recent entanglements. We can and must use military force when necessary, and be willing to leave the option on the table when our security is threatened. However, we also need to engage politically and diplomatically to further our interests — as well as the interests of our allies — as long and as often as possible. Peace through strength allows safety economically (Case 1) and from the art of war. Therefore, my moral value is safety. Cutting military spending will cost some of the people in the military their jobs. Many people rely on the military for their lives and money. They pledge to protect our country with peace through strength. In return, we give them a stable wage and a reasonable method in which to live. If we didn’t have this giant military jobs program, the U.S. unemployment rate would be over 11.5 percent today instead of 9.5 percent.This isn’t an argument for more military spending. Just the opposite. Having a giant undercover military jobs program is an insane way to keep Americans employed. It creates jobs we don’t need but we keep anyway because there’s no honest alternative. We don’t have an overt jobs program based on what’s really needed. When you decrease wages or jobs for the military, it decreases the chance that the population will join the military. This jeopardizes our value of peace through strength. This also means researchers for the military may be cut funding. This would jeopardize our scientific development. "The federal government should not be spending defense dollars for the sole purpose of stimulating the economy. For example, some have argued that the Obama administration should continue purchasing unnecessary F-22 fighters because close to 100,000 potential jobs would be lost from stopping production at 183 fighters—a recommendation of Secretary of Defense Robert Gates. Instead, the DOD should spend funds that would have to be spent eventually on people, projects, and reset that would enhance our overall security while enabling the economy to recover. While this would mean a temporary increase in the overall defense outlays for FY 2010 and FY 2011, it would also mean that in 2012 and 2013, defense spending on items such as military construction would tail off sharply when the economy should be back to its normal level of activity. This will be all for the first round. To uphold the duty of peace through strength, decreasing military spending would be unwise and not practical. There are many different fields and contractors being funded by this amount of money. We need to make sure they prosper. Touma has to save a girl who is about to be murdered against a madman with the power to control vectors. Watch his amazing last stand! 1. The United States should not decrease the military budget because the U.S. needs its high military spending to remain the dominant power and lead the world. 2. The United States should not decrease the military budget because the United States needs a strong military to protect and defend our nation and enforce a "peace through strength" policy. 3. The United States should not decrease the military budget because cutting U.S. military spending will cost jobs. 4. The United States should not decrease the military budget because raising military spending increases output of economy. Argument #1- The United States should not decrease the military budget because the U.S. needs its high military spending to remain the dominant power and lead the world. This argument assumes that the United States strong military is due to its high spending, and I admit there is some truth to that but that is not all that determines the strength of a military. Remember, I am arguing that we should decrease overall U.S. military spending but am not arguing we should lower it to the point where it is lower than other nations. The U.S. already has a higher military budget than seven of its rivals combined, and decreasing it to the current federal deficit($439 billion as of 2015) would still be more than twice that of China($216 billion as of 2015). Of course, this would happen gradually since I proposed the military budget would slowly decrease, so we don't know what the U.S. federal deficit will be a while from now. To show why a higher military budget doesn't necessarily lead to a stronger military, we must first look at military strength which is measured by Global Fire Power(GFP). Globalfirepower.com determines a nations military strength by giving it a measured Power Index score. Scores are determined by a finalized ranking relying on over fifty factors. As you can see on the site, Russia is ranked #2 and China is ranked #3, but hey wait a minute? China has a higher Defense budget than Russia but with less overall military power(about a $109 trillion higher budget)? Even though the United States spent more than 12 times the amount of russia on the military, Russia is still close to the United States in overall military strength. The explanation is that a higher budget does not mean more overall military strength, it is how the spending is used rather than the amount spent. A post on usnews.com provided great examples: "As the Pentagon prepares for the formal release its budget next week, there is much talk within the department that the $600 billion-plus that is likely to be proposed is inadequate. In fact, rooting out billions of dollars of waste in the Pentagon budget would leave more than enough to provide a robust defense of the country without increasing spending. So it is really smart spending rather than huge spending that determines a nations military strength. So the United States can save itself a little from its bad spending habits by decreasing huge military spending and keeping to smarter spending in the right areas. The United States really needs to change the way it spends. So there is no need for its huge military spending that adds to the deficit and national debt. The United States can still maintain a strong military to lead the world. We should more focused on HOW the U.S. spends rather than HOW MUCH it spends. Argument #2- The United States should not decrease the military budget because the United States needs a strong military to protect and defend our nation and enforce a "peace through strength" policy. The rebuttal I used for Argument #1 is sufficient enough for this argument. The United States does not need the high military budget it has to be able to successfully protect its citizens and enforce "peace through strength". So, the United States can cut spending on military to deal with the federal deficit without worrying about too weak of a military. It is important we also focus on problems here at home rather than just a high military budget. Argument #3- The United States should not decrease the military budget because cutting U.S. military spending will cost jobs. One problem with this is that China has more military manpower than the united states due to a higher population and still has a much lower Defense budget. This is mostly because the United States spends more on aircraft like helicopters and other aircraft(even though china had more tank strength). So, the United States could cut military spending without a loss of jobs. Just less spending on other expensive areas such as aircraft and helicopters. We can use some of the military jobs for border patrol and spend on defense rather than the high cost of war. Also, if we use the dollars saved on defense spending, it can be used to reduce the federal deficit which can help with interest rates. We can even use veteran programs to help the veterans with lost jobs to find a new career. Overall, less military spending doesn't necessarily mean lost jobs. Argument #4- The United States should not decrease the military budget because raising military spending increases output of economy. This is the best argument used by the con. However, military spending is not the best way to stimulate the economy. Spending can be better used for capital equipment that can be used to generate more income and economic activity. Of course, military spending helps a lot on stimulating technological innovation, but when it comes to jobs and the very bad U.S. spending habit, every bit of decreasing in the military budget can help towards the federal deficit. Michael O'Hanlon agrees that military spending is not the best job creator… in the long term." Thank you cooldudebro for your first round argument. "The Military employs numerous types of air, land, sea and space technology and equipment. Engineering and Scientific Research officers work on the advancement of such technology, as well as the maintenance and management of existing equipment. These officers work with emerging technology to create the equipment of the future and have been responsible for many modern conveniences we take for granted." Our military budget is used for more than combat and weapons. It is used for research and development. That is why we put so much money into the military. I extend my previous arguments that the USA spends its budget on more than just military and man power. It spends money on research and development. It spends money on giving veterans and people out of the army a chance for college. The rising cost of tuition can be hard to manage, but the Military’s Tuition Assistance Program provides service members the opportunity to enroll in courses at accredited colleges, universities, junior colleges and vocational-technical schools. Each Service has unique programs that can help with tuition for anything from professional certifications to a graduate degree. To qualify, there are usually conditional requirements – such as having a minimum time remaining on your service contract and a cap on credit hours (or dollars) per year. Some programs, such as the Coast Guard’s College Student Pre-Commissioning Initiative, also require that you attend a school from a designated list. Tuition Assistance pays for up to 100 percent of the cost of tuition or expenses, up to a maximum of $250 per credit and a personal maximum of $4,500 per fiscal year per student. This program is the same for full-time-duty members in all Military Services. Selected Reserve and National Guard units also offer Tuition Assistance Programs, although the benefits may vary from the Active Duty’s program. The Post-9/11 GI Bill became effective on Aug. 1, 2009, and has the most comprehensive education benefits package since the original GI Bill was signed into law in 1944. Veterans who have served after Sept. 10, 2001, with at least 90 days of continuous service, are eligible. The Post-9/11 GI Bill also gives Reserve and Guard members who have been activated for more than 90 days since 9/11 access to the same benefits as their active-duty counterparts. The actual benefit amount will vary based on an individual’s total length of service. For example, those who have served at least 36 months or 30 continuous days prior to discharge for a service-connected disability can get maximum tuition and fees, a monthly housing stipend and an annual stipend for books and supplies. Those who have served at least 90 days, but less than six months, receive 40 percent of the maximum benefit. These benefits are payable for up to 15 years following a member’s honorable discharge or retirement from service. Another aspect of the Post-9/11 GI Bill is the Yellow Ribbon Program. Colleges and universities that participate in this program contribute additional funds toward educational costs that exceed the maximums allowed by the Post-9/11 GI Bill. Institutions may set the amount they wish to contribute, which is matched by Veterans Affairs. This can be very beneficial for students at private colleges and universities, graduate programs or those attending with out-of-state status. The Post-9/11 GI Bill also offers service members the ability to share educational benefits with family members. In exchange for an additional service commitment, a service member may be able to transfer all or part of his or her earned benefits to spouses and children (including stepchildren). This is a first for the GI Bill and opens up new opportunities for service members and their families. For examples and maximum allowances state-by-state, visit the Veterans Affairs GI Bill site or speak with a recruiter. College Fund Programs (also known as the GI Bill “kicker”) offer an additional amount of money that can be added to the Post-9/11 GI Bill. Each Service branch has College Fund Programs; however, the incentives and amount received vary with each branch. College Fund Programs are offered to service members when they first join the Military. Two mandatory qualifications are you must have a high school diploma and you must be enrolled in the Post-9/11 GI Bill. Depending on your Service, test scores and occupation, there may also be additional requirements. Talk to a recruiter to find out if you are eligible and to ask for an application. Programs such as these are reliant on generous funding from the government. If the government were to cut funding to the military, it would make programs like these non-existent; which would hurt the job market. I believe this applies for rebuttal four as well. Instead of making arguments for why I think decreasing U.S. military spending is not a bad idea in this round, I will instead point to proof that the economy can do great with a lower U.S. Military budget. This proof lies in the U.S. economy of 1995-2001, during president Bill Clinton's terms. When the 42nd U.S. president, Bill Clinton took office, the economy started doing better and the U.S. had a SURPLUS instead of a deficit. Bill Clinton holds the record for most average job gains per month during his presidency. The economic performance of the mid to late-1990s is enough proof that the economy can do great with a lower military budget. All this can happen under a lower military budget than the United States has now. One last thing, I mentioned this in round #1, Iceland hardly has a military but is ranked as the most peaceful country*4. This shows that there can be peace without a large military. Intervention into the world is what can lead to more hatred. It is time we stop wars and value peace. War is not peace because war is conflict. 1. The United States should not decrease the military budget because some of the budget is spent on research instead of weapons. 2. The United States should not decrease the military budget because some of it is spent on giving veterans and people out of the army a chance for college. This argument is automatically refuted by the fact that research and development went up in the 1990s when their was a lower military budget. Like I said, the military budget was lower(at about $339 billion inflation adjusted). Much lower than it is now. Military spending can still be cut while maintaining research. In fact, I prefer the U.S. spends MORE on research, but it only is a fraction of the overall budget. Like what happened during Clinton's terms, we need to refocus our research and development by using smart spending instead of wasteful spending. "There is great room for reducing the overall military research and development budget -- without harming military preparedness at all -- by significantly overhauling its structure. Currently, the Pentagon spends only about 15 percent of its R&D budget, or about $12 billion, on what most reasonable observers might call productive research. That number needs to rise to at least $16 billion to meet the defense and civilian needs of the country. The U.S. can cut spending to help with its deficit and debt while maintaining research and development, it all depends on where the cuts take place. It may would be best to spend less on fighter jets and other vehicles and weapons used for war and direct more of it to research and development. The money saved on military spending can then be used to decrease the federal budget deficit. THE UNITED STATES SHOULD NOT DECREASE THE MILITARY BUDGET BECAUSE SOME OF IT IS SPENT ON GIVING VETERANS AND PEOPLE OUT OF THE ARMY A CHANCE FOR COLLEGE. I already mentioned this in the first round, some money can be directed toward education, but I do not necessarily want to cut spending on the Military’s Tuition Assistance Program. Military spending cuts are already taking place in the U.S. I do not want to stop this program but instead want to cut spending in other wasteful areas such as built projects that went to no use and jets and weapons used for war. Overall, these arguments fail against my case because it ignores how the budget cuts can take place and where they did take place. Our military spending compared to the world. (2) We started spending less. Now, with such a large budget, you'd assume it wouldn't have an affect, right? If you thought that, you are wrong. We see massive deployment rates go down. With these small cuts, the military deployment where needed was significantly reduced; leading areas that need our support left to falter. This isn't the only affect to our military. "The $46 billion dent to the Pentagon’s fiscal 2013 budget, long considered by the brass as nothing more than a political pawn, has taken on an air of inevitability, forcing commanders across the military to plan for painful reductions and argue that American lives and livelihoods are hanging in the balance. Injecting ominous warnings about national security into policy debates has in the past snapped elected leaders into action, but there is no sign that Republicans and the White House are close to compromising on a more measured approach to reducing the deficit. Some lawmakers and analysts have dismissed the caution as posturing by a force reluctant to shrink too much in a postwar era. In response, the military’s service chiefs are amplifying the months-long warnings of Defense Secretary Leon E. Panetta and others and providing what they have described as the specific and serious consequences of the across-the-board cuts. Gen. Ray Odierno, the Army’s chief of staff, recently warned that the cuts may curtail training for 80 percent of ground forces, including some in the deployment pipeline, forcing him to extend the deployments of troops already in Afghanistan. Facing a $8.6 billion shortfall, the Navy has delayed the deployment of the USS Harry Truman, leaving just one aircraft carrier instead of two in the Persian Gulf, where tensions continue with Iran. The budget crunch also will mean delays for repairs of a carrier and the construction of another. The Air Force has warned that slashing $12.4 billion from its budget for the remainder of the fiscal year would require cutting 200,000 flying hours. That means that by May, two-thirds of the force’s pilots would “drop below acceptable level of readiness,” Air Force chief Mark Welsh told lawmakers recently. After holding out hope for a compromise, Pentagon civilians were startled Wednesday when Panetta notified 800,000 employees that they might face a 20 percent pay cut if furloughs are implemented starting in April. Although the payroll for uniformed personnel is spared, the threat of extended deployments has confounded troops in Afghanistan. With cuts set to begin March 1, Odierno said in a speech last Friday that the Army is scrambling to find up to $24 billion in reductions for the last seven months of the fiscal year. The shortfall will affect training, he said, presenting a thankless choice between sending untrained troops to Afghanistan and keeping certain units there months beyond their exit dates. American lives are at stake, he warned. Some lawmakers have reacted apologetically to the predictions of a dangerous drop in readiness. But other lawmakers and analysts say the Pentagon’s doomsday predictions have a measure of hyperbole and might be, at least in part, an attempt to protect budgets and programs as the war in Afghanistan draws to an end. "The military is not all fighting and hardware. The training offered 1 million youths is in many cases superior to what they now find on today’s college campuses. They leave the military with skills and responsibilities, and without student loans; all too often, in contrast, our twenty-something students pile up debt without skills or real learning on contemporary campuses. We trust 20-year olds in the military to guide $100 million jets on carriers; in contrast, I find it dangerous to walk across a campus parking lot with 20-year-old students running through stop signs. Since we had an amble budget for our military before Obama took office, we were ready and willing to engage enemy opponents. With budget cuts handicapping the military with more gradual cuts to come, it seems we won't have the power to deal with them. Despite these cuts, our national debt is increasing rapidly and steadily. (5) Cutting military spending will not fix this. It makes the military worse and less ready to deal with conflict when needed; while doing nothing to help our debt. "Former Federal Reserve Chairman Ben Bernanke warned Monday that reduced defense spending could have adverse long-term economic impacts, including undermining technological innovations that ultimately produce jobs in the private sector. Speaking at a Brookings Institution event, Bernanke said, “By far the most important (impact), certainly in the United States, has been the linkage between defense military appropriations and broader technological trends. Bernanke cited as examples the Manhattan Project and the creation of the Defense Advanced Research Projects Agency, the precursor to the Internet. “If the same money had been spent on basic science that would have probably been an even better strategy, that would be even better … but the political system is not good at making long-run investments with uncertain impacts,” he said. Bernanke says most reports about the size of military spending relative to other countries is misleading. “One number that bothers me is a lot is the journalistic tendency to say that the United States spends more money than all our potential competitors combined. Therefore, we are militarily secure. That is a mistake,” he said. He said purchasing power parity is a better way to measure defense spending. “Under PPP comparisons, instead of being 45% of world military spending, U.S. military spending is a third of global spending,” he said. It hinders our military and our duty to maintain peace through strength. 1. The United States should not decrease the military budget because it hinders our military and our duty to maintain peace through strength. 2. The United States should not decrease the military budget because it hinders economic growth. THE UNITED STATES SHOULD NOT DECREASE THE MILITARY BUDGET BECAUSE IT HINDERS OUR MILITARY AND OUR DUTY TO MAINTAIN PEACE THROUGH STRENGTH. I already have a rebuttal to this in round 2. Even after decreasing the military budget, the U.S. military can remain powerful like it has always been. It is smart spending. We can save money by cutting the pentagon budget which is used very wastefully, and spend the money in other areas like education(which is a disappointment in the U.S.) or it can be used for the United States federal deficit or National debt. If you do not believe that a military can remain powerful with decreased military budget, then explain why Russia has a higher rank on the GFP scale than China but with a lower budget than China. It is time we end wars stop policing the world which can lead to more hatred towards America. THE UNITED STATES SHOULD NOT DECREASE THE MILITARY BECAUSE IT HINDERS ECONOMIC GROWTH. CON uses the current military budget cuts that are taking place. I am not going to argue for these budget cuts but instead point out that there are different ways to cut the military budget. 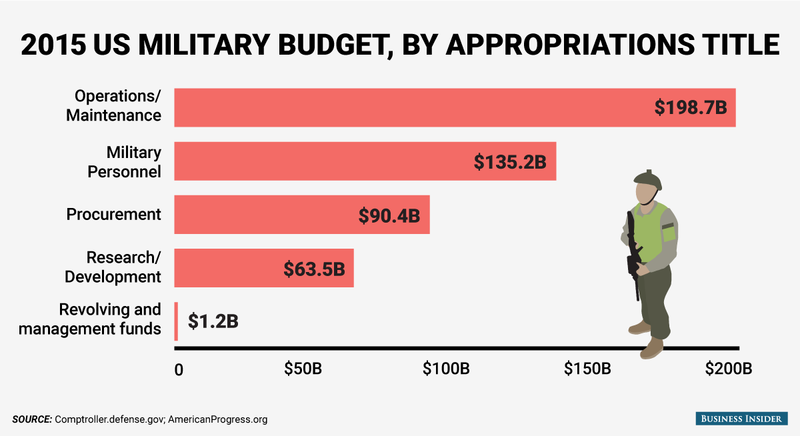 Much of the military budget is used for wasteful purposes and is needed for other areas such as education or healthcare or the deficit and debt. "In prioritizing military spending, Congress is cutting the very programs that can actually strengthen our economy: Cutting federal assistance to the states, forcing them to lay off teachers, firefighters, and social workers; cutting opportunities for job creation, training, and placement programs; and eviscerating funding for children’s programs and assistance for seniors. The military is not the best job creator if compared to other job creating investments such as education or healthcare. Even though we lead the world with the strongest military, the U.S. is a disappointment when it comes to education and has the highest debt. My opponent says that cutting military spending can not help fix the debt, this is nonsense, the U.S. has much debt because of a spending problem, so decreasing spending can indeed help fix the national debt. My opponent points to the fact that even after the military budget cuts, the national debt continues to rise. This is due to all of the high total spending and budget deficit. If the deficit were to become a surplus(like what happened in 1998), the national debt would then be able to decrease. I do not necessarily want across-the-board cuts in U.S. military spending, this is not good for the military. Instead, it should be cut in more wasteful areas. As far as technology development, under Bill Clinton we have seen internet rise and more technological developments with a lower military budget. $63.5 billion of the U.S. military budget is spent on research and development, it does not need to be cut. What needs to be cut is the unneeded and wasteful spending on cold war weapons and spending in other nations for trying to police the world. We need to stop this and cut military spending and use the money in areas we need. Overall, the U.S. does not need its high military budget but it needs to fix other areas and its increasing debt and deficit. The future of America should be better than it is now and we can achieve this with a better education for our children, a lower(or none) national debt, better Healthcare/Social Security, greater peace, and a safe country. Decreasing Military spending is one way to get closer to this. Thank you for your time and I hope you choose PRO. Due to a situation in the family, I will have to extend my arguments for this round. I wish I could change the name of the debate to,"The United States should decrease its military budget". This was a win by the slightest of possible margins because most of the arguments in the debate negated each other but there was little analysis provided by either side on why each argument was conclusively won by either Pro or Con. I will give a brief outline of this decision and am more than happy to go through the justification argument by argument in the comments as I have five pages of additional notes for this debate. 1. Is it possible to reduce spending? Pro: "smart spending" with a model of Clinton's policies. The was a serious lack of definitive mechanism in this policy which meant that Con was guessing what spending you would be reducing and you were responding with "we can keep that spending". This is really bad form in a debate and made this particular debate really messy. However I was shown that waste exists and that it is possible to spend less on the military. I was also shown that the current budget appears to be vastly inflated next to every other power which added weight to the argument that it is possible to reduce spending. One of the problems that this analysis had is that it was directed at argumentation you expected rather than the analysis you were given. This meant that particularly the examples seemed out of place. All the examples I am given is why austerity is harmful and why large cuts to the military is bad. This becomes unresponsive when Pro says things like "I just want to reduce waste and that is possible by prioritising the right things". What I needed from you was an explanation of why things like personel will be seen as wasteful and there will be political pressure to cut those areas even under Pro's policy (or any policy where military spending is reduced). This would have meant Pro had to do a lot more work than say "I am not proposing to do it that way" to deal with you're attacks. You also don't deal effectively with the analysis that the military budget in the US is inflated so much it is unreasonable. You simply say "it is required because we need to be the global security force". You need to be more comparative here. Prove why America MUST be the global security force and explain why such a highly inflated budget is necessary. Pro does enough by saying it is a combination of powers that provide this security and having so much more than the UK for example seems unnecessary. This then becomes a point about military efficiency which I will deal with separately. On this issue in the end I am convinced we can and should reduce spending A LITTLE but this has to be done carefully with no understanding of why it cannot be done carefully. It is an unsatisfactory win to Pro on a very small impact but it is a win nonetheless. 2. Will the military be effective? So the idea of Global Fire Power actually having a scale and the ability to show it can be high despite smaller budgets supports what was outlined on the feasibility of of reducing military spending. However this can be improved by showing specifically why America is lower and how reducing spending and prioritising different things would increase this. As it was it was shown to be possible by way of example rather than probable by way of analysis. The idea that the US should be like Icland is unrealistic and unnecessary for this debate. What you start to do is show why engaging in unnecessary conflict is bad and increases the budget but what you don't do is prove that the US will not engage in unnecessary large scale conflicts. Where you win back ground is by showing how bad military strategies lead to unintended bad consequences even when the military spending is very high. This is actually supported by one of Con's graphs. Here you give me reason to believe that effective militaries are more about effective strategies than large amounts of spending. This supports the idea of the fire power being more important than the overall budget. However in order to win this argument you need to prove that there is some reason why redistributing money and spending less of it would mean that the military can make effective strategies. As it was you showed that military strategies are not necessarily linked to the size of the budget and bad strategies can happen even when there is a large amount of funding in the military. This doesn't win the argument of military effectiveness but it does mitigate the attacks from Con which can I will go through now. This argument is mostly made in round 3 and you suffer massively in that round from ill explained graphs and large quotes without explaining the point of them. This meant you left most of the interpretation of the graphs to the judges. Quotes the size you were using means that there is a whole lot of unnecessary information in them and the important parts loose relevance. You really need to prove your logic first then support it with examples and quotes. As it was I had to guess how much of it was relevant and what the logical conclusion of it was. Since the Afghanistan war was considered "over" there has been a dramatic reduction in military personnel present there and this has brought the costs of military spending down. This sudden lack of boots on the ground has been an ineffective strategy. The problem is that you don't give me a standard by which to measure how "effective" the military is which means you don't engage with Pro's global fire power scale arguments. You then have an issue with the order of cause and effect in your own argumentation. Your argument suggests it was a military decision to end the US involvement in Afghanistan that caused the lowering in the budget rather than military personnel being reduced due to budget cuts. This suggests a bad military strategy for that particular conflict rather than a logical example of why cutting the budget will always lead to a less effective military. Given that you don't provide your own definition of effective military and Pro has shown that it is possible to have a "strong" military on a lower budget then your argument does not clash effectively. At the end of that all I am convinced of is that bad military strategies are bad but no one proves conclusively why any of this relates definitely to the size of the military budget. Pro gives a little more analysis to support the first argument of why it is possible which makes their case slightly more believable but neither debater conclusively wins the argument of military effectiveness. 3. Will the economy improve? There was a lot of discussion on the economy but again no debater conclusively wins this argument. All the analysis provided ends up as possibilities rather than probabilities. Stimulate the economy: Con says that military spending can and should be used to stimulate the economy and Pro argues that other spending can and should be used to stimulate the economy. Neither side proves to me what they think is the most important factor in economy stimulation and why that can happen best through military funding or through other funding (education and healthcare). Both sides look at job creation and loss to try and argue for improvements to the economy but the same problem exists. Con argues that the military is a large government employer and there is the potential for high numbers of job losses but no real analysis on why there will be such a high number of jobs lost just that that is a potential situation. Pro argues that jobs can be created elsewhere and argues that it is cheaper to create jobs in education than the military but doesn't prove to me that the jobs will be created so again it is just left as a possibility. It seems reasonable to believe some jobs will be lost and some will be created but I have no understanding of whether more will be lost or created so there is a limited impact of this argument on the debate. Pro convinces me that the US needs to reduce the deficit but does not prove that their method of reductions to military service will actually reduce the deficit itself meaning that at best it goes a little way to helping out with the the deficit problem. Con then uses the wrong example which means that the analysis is non-comparative. The use of the example of debt rising is what I am discussing here. Pro correctly points out that debt will continue to rise until the country has a surplus rather than a deficit. 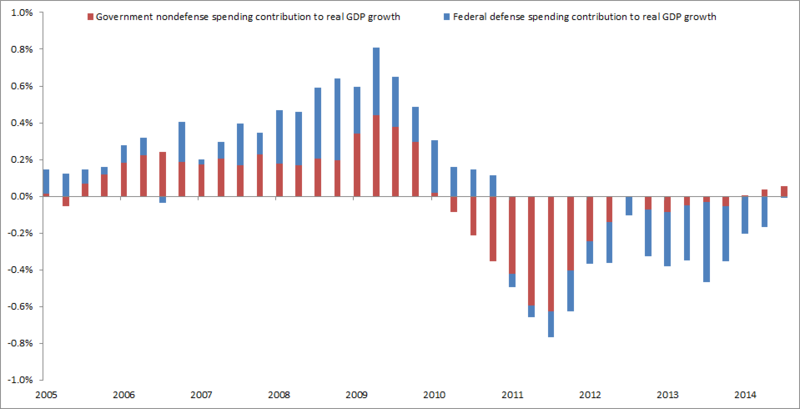 This means that Con's claims that lowering military spending has no positive effect on the economy is limited. Then there is Pro's graph showing that ALL government spending has a negative effect on GDP after austerity measures were introduced. This suggests that it is the policy of austerity that was the issue not a reduction specifically to the military budget (focus sing on reducing waste and prioritising different spending strategies). This means that this example has limited impact in this specific debate and because there is no further analysis as to why specifically reducing the military budget will have a negative impact. At the end of all that I am convinced it will probably have very little actual impact on the economy but that reducing waste in a country that is spending too much seems sensible even if it is only a small amount. Again this supports Pro's initial claims but does little to actually win the argument over the effect on the economy. Like I said at the start, this was a win by a very small margin and I am happy to have an extended discussion in the comments about it. Both of you need to do a lot more work to prove why what you are arguing is likely to happen rather than just possible. You can do this by explaining what political incentives exist when it comes to military spending and why this means that less spending will either be a failure or a success. Be directly comparative to what your opponent is saying. Don't just explain why your argument is also possible explain why it is far more likely to happen than your opponent's outcomes. The problem with not doing a comparison is that most things are possible as outcomes so you leave the judge to decide one they believe is the most possible. Set up each argument by explain which situations you are going to be discussing and why you have selected that perspective. Then walk through the analysis to prove the logical consistency in your argument. Then use examples to back up what you have already proven. Be careful to explain why each example is relevant as well. The next thing you could both benefit from is clearer headlines and a slightly neater structure. Use italics for quotes and bold for your titles or whatever suits you just make it clearer where I can find your analysis and responses in your posts. Find a structure that is clear and works for you but you want the judges to be able to look back through all of your work quickly to find your best responses and so it is always clear exactly what you are trying to prove in your post. I am also happy to discuss more individual feedback if the speakers ask for it. Thank you for your judgement, I think it was great. I see one of the main problems in this debate was us focusing on possibility rather than what will likely happen. I guess I could have compared what has happened in the past with decreased military spending with what could happen if the military budget was decreased. I am not going to criticize your judgment but will say that I find it hard to argue about what is likely going to happen with a decreased military budget because so many things could happen. You say that we should have had a neater structure, was it hard to find my responses? I thought my way of doing it wouldn't make it hard but I guess it may be flawed. You just have to give me some type of justification for why you think your outcome is very likely to happen (ie more likely that the outcome your opponent is claiming). Obviously none of us know exactly what actually would happen but then you are only trying to win a debate here not win round politicians. Get as close as you can to the standard juries are held to (ie beyond reasonable doubt) and you will be well on your way to actually winning the argument rather than presenting the argument. Make your headers bolder and maybe have a bit more space between the header and then the analysis. It was readable when I was going through every sentence but when I go back through the debate to double check responses you want the judges to be able to find those responses as quick as possible and as easily as possible. Not a big change but little things like that do make a difference.